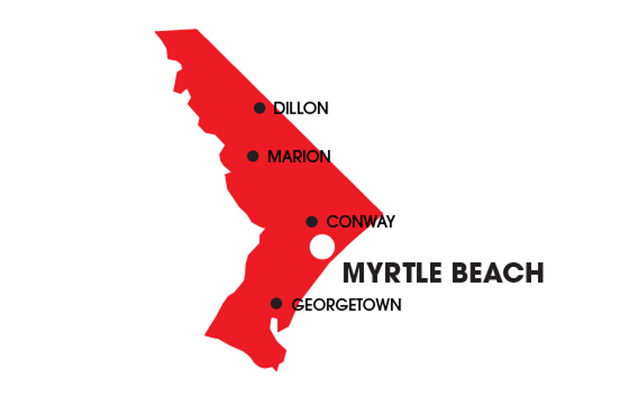 Our Myrtle Beach Office serves the Grand Strand and surrounding communities. Since 1949 – Southern Elevator has been the premier Elevator Service Company in the area. The trained technicians at Southern Elevator Co. Inc. deliver a wide range of maintenance and elevator repair services to customers in Myrtle Beach. Since the early 1990s when we acquired the local company Atlantic Elevator, our client base has included commercial office buildings, medical facilities, residential and other premises. We provide elevator installations in Myrtle Beach and the surrounding areas, which ensure the safe and reliable vertical transportation of passengers in all the City’s locales. Located on the east coast of the United States in Horry County, South Carolina, Myrtle Beach lies in the center of a 60-mile stretch of beach called the “Grand Strand.” As a prime destination for tourists, the city is also one of the fastest-growing metropolitan areas in the country. While the economy is dominated by the tourism industry, it also has a manufacturing base that produces plastic, cardboard, foam and ceramic products on a relatively small-scale. The retail environment is exceptionally dynamic, with the many stores and malls making it one of the largest shopping areas in the region as well as an active market for elevator installations in Myrtle Beach. The golfing industry also enjoys a strong presence, with around 95 golf courses in and around the city. The installation of new elevators is a complex project whether it takes place on existing premises or a new construction site. Southern Elevator Co. Inc. strives to manage every aspect of elevator installations in Myrtle Beach buildings, and our team of expertly trained technicians has the most modern equipment available for the job. All work is done in accordance with our stringent safety policy, and with our six decades of experience, we are perfectly placed to complete your project on time and within budget. As the leading provider of elevator repair services in the area, we offer free elevator inspections to companies experiencing problems with their elevator systems. Whether these inspections identify the need for a repair or a complete refurbishment, Southern Elevator Co. Inc. can deliver the solution to any retail outlet, government office, military base, airport, manufacturing plant or university. In addition to elevator installations in Myrtle Beach, our teams of highly trained technicians also perform services such as elevator testing, cab refurbishment and modernization. Companies in the Grand Strand area have enjoyed the benefits of our expertise for many years, and we anticipate serving them for decades to come.